There is a famous scene in the movie “Lost in translation” where an American actor is at the shooting of a commercial in Tokyo. Since he does not speak Japanese, he has a translator so he can communicate with the director of the commercial. The director explains him vehemently, with big hand gestures and with many details how and what he should do – of course in Japanese. The actor’s translator translates the one-minute monologue to: “Look into the camera with intensity!”. Unlike the American actor, Deniz Sakaoglu did not get lost in translation. 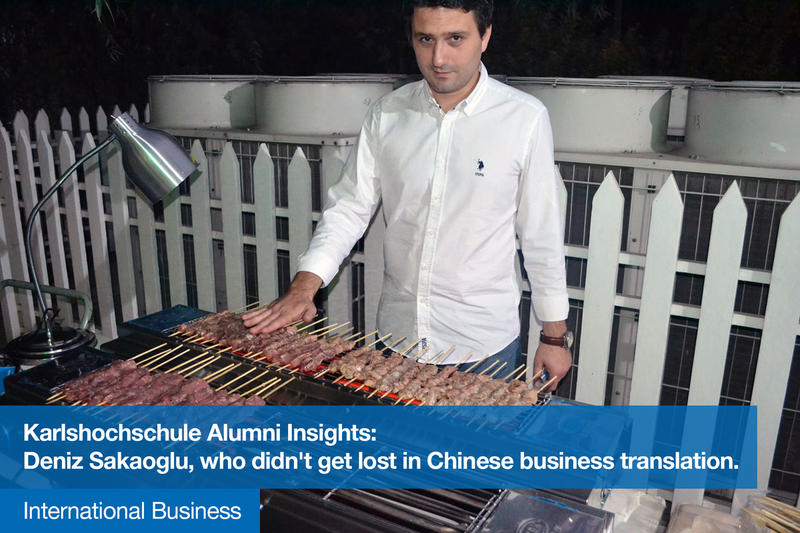 Not only did he not get lost, but also managed to translate his ideas into success – in China as a German-Turkish young man who graduated from a German university. Karlshochschule is proud to say that it plays a big role in its students’ personal development. Did it have a similar impact on you? What were the influencing factors: modules, professors, class trips? My most challenging and at the same time, important module was the Bachelor thesis where I had as my mentor Prof. Dr. Lutz Becker. At the beginning of me writing this thesis, my suggestions were often refused by my mentor. He tried to push me into a direction to write my thesis within a certain framework. He forced me to go away from very traditional approaches to analyzing problems connected to business and go towards a cultural perspective that proved to match very well with my particular topic. So I had to start all over again, a phenomenon that often occurs during writing a Bachelor thesis. Fortunately, this tough process yielded to a successful thesis. You chose a very interesting topic for your Bachelor thesis: introducing the Döner Kebab in China. The difficulty not only arose from the fact that you had to do a consumer research on food people have never tried or heard of before, but also because you were searching from another continent, from Europe, Germany. So, Deniz, why China? And why the Döner Kebab? While answering the research question of your thesis you took a cultural perspective. What made you to do so and what impact did this decision have on the outcome of the paper? Did Karlshochschule and the fact that it encourages keeping the cultural perspective in mind when approaching problems, play a role in your decision? At first, it seemed a little bit out of reach and I was not sure whether it was really relevant for business matters. But after being actually pushed into a cultural framework, I realized that approaching the whole case from a cultural perspective can be extremely helpful to get a much better understanding of behavioral patterns of people in different cultures. Especially in my field of interest, which was food and beverage that in itself is already heavily attached with cultural meaning, I started to feel that the cultural perspective was a very appropriate framework. Seeing how important status symbols and self-expression through consume were in the Chinese culture and given the fact that Western “products” were considered status symbols in China, I decided to detach myself from the simplified idea of seeing the restaurant business as plainly selling food and beverages. I rather thought it was a lot more appropriate to see the purpose of the business in selling a whole package of experience – the Western experience. And that honestly is exactly what the Chinese customers are looking for when entering a Western restaurant. They want to live the whole experience from the interior, entertainment, way of serving to the food and drinks themselves. We might sometimes even add some elements to the restaurants that we know Chinese people perceive as being typical for the particular country theme. This idea of an ’experience package’ especially in regard to the German restaurant that you have opened, I think makes all of us interested. How does it look like in China and what do Chinese think about it? Why do they like it? China is a country where a part of the population just since some years has the money and the opportunity to live a more “international life”. Even if they do not leave the country due to not enough money or courage, they would like to experience the metropolitan world. A Western restaurant is a very good solution for this problem. And why would someone open a German restaurant? Because Germans have a great reputation in China, they are admired for the effectiveness and their way of living. I would say, Germany is one of the most popular countries in China. Besides this they have a special attitude towards USA: on the one hand, they admire it for its lifestyle, but on the other hand, they dislike them due to political reasons. This is also similar concerning Japan. Nowadays Greece is a very popular holiday destination. They are fascinated by the white and blue color schemes that draw through all the coast villages of the country. What type of non-Asian food do Chinese people like? They really like the German restaurant we opened. Actually it is not only the food they are coming for but the beer. They love it! The “Kölsch” [eds. it is the local beer of the city of Cologne, “Köln” in German. It is one of the palest German beers made. ], for example, they really like. And beer in general is something that Chinese people like to consume a lot, which I guess makes them very keen to try beers from many different countries. The Nr. 1 German dish for them is: pork knuckle [“Schweinshaxe” in German]. I have not eaten half as much pork knuckles in Germany than here in China. It’s not only German cuisine they like, but also the Italian and American ones. Beijing is especially multicultural, you can get almost any kind of food you would like. This is mostly because of the big foreign communities living here whose members are the owners of most of these restaurants. How did the whole opening of the restaurant happen? How did you start? Do you speak Chinese? No, not fluently. This is partly due to the fact that I had from the very beginning assistants who helped me with the translation and interpretation of the Chinese language. Nowadays I would not call them just assistants anymore, now they are a very important part of the management of the company. One of the biggest challenges was to find the right staff. For 1-1.5 years I was mostly working on understanding the culture and the way things work. This is one of the main reasons why many Western investors give up after some months in China: they don’t know how to make their staff understand the corporate culture of their company. They don’t understand that starting a company in a foreign country means adjusting to the environment and not trying to change the environment. I, myself, started off in the spring of 2010 slowly to get to know China and how to do business here. First, I had a company in Lijiang (South-West China), with not more than 20 employees. This was the trial and error period. Then the management team together with me moved to a bigger company in Beijing, where at one point we had around 130 employees (I think I supervised all in all more than 400 employees, due to the fact that in the food and beverage sector there is a very high employee turnover). We moved from that company recently. Now we are managing a company in Beijing with 35 employees. How do you prepare yourself for a meeting with a potential partner? Starting a relationship with a Chinese businessman is a long process. I would not even advice anybody to talk about any business-related topic on the first or even second meeting. One really has to develop a very good informal relationship before starting to talk business. Though, when a relationship is established then everything becomes easier: the Chinese will show loyalty and fulfill “extra demands” as long as they feel respect and responsibility from their partner. I think, this is similar in Germany too, but not that emotional. Therefore it is easier to develop business in China when one has a good network relationship, the so called: Guanxi. You mentioned that one has to adapt to the environment. What were the aspects you had to get used to? There is a big difference for example in how you are supposed to handle leadership in China compared to Germany. Due to Chinese culture the boss in China could never be as direct as one in Germany. According to the situation a company leader in Germany can raise his voice without being considered out of line. In China this can lead to immediate resignation. If you make a Chinese employee lose face in front of other colleagues you will lose the employee. The best way to deal with Chinese people in a work environment is to stay calm and friendly. Saying things you don’t agree with or you are unhappy about in a calm and friendly way is a lot more likely to serve your purpose. Similar differences between the mentalities can be very well illustrated by my relationship with my first partners: when I arrived here first I had mostly Chinese partners who had a very traditional way of thinking about business. It was very difficult to get things done with them, since it would always take them a lot of time to make decisions and bring decisions on official platforms. Even when buying the material, it felt like I would be the one selling something, as they would not try hard at all to pursue me to buy things from them. Furthermore, a big problem in China is communicating the “ugly truth”, a piece of unpleasant information. Employees often try to solve a problem themselves, and turn to their employer just in the last minute and by this time they might have made it even worse. One industry specific difficulty for food and beverage are the entirely different perceptions between the Chinese and Western cultures of what restaurants actually are. Generally spoken (for Chinese lower and middle class which constitutes around 90% of the population) restaurants are considered just places where one can eat, nothing more. The service aspect plays a very small role and the industry definition for most Chinese restaurants could be melted down to “the food selling industry”. In many Chinese minds the Western perception “service industry” is non-existent, which turns the training of Chinese employees in Western restaurants into a big challenge. You underline the big discrepancy that exists between the Western and Chinese service in a restaurant. What are the most striking differences? In a Chinese restaurant, for example, between the moments you get your food and when you pay, there is no attention paid to you. Unlike in Germany, where the waiter would come and ask: “Ist alles in Ordnung?” [“Is everything alright (with the food)?” in English], in China you, as a customer have to scream through the restaurant in order to catch the waiter’s attention. Furthermore, they bring the meals in the order they get ready, that is to say you might get your main dish and the dessert, while your friends would be still waiting for their starter. The reason for this difference is that the concept of a serving sequence like “appetizer, main dish, dessert” doesn’t exist in Chinese eating culture. In a Chinese restaurant your cold appetizers, hot appetizers, main dishes etc. will be brought to the table as they are ready and everybody will share a big variety of different dishes. People don’t order for themselves like it is done in Western eating culture. Do you have a certain vision you follow when managing your restaurants? What values are important for you? First of all, we consider our employees a very important asset. The salaries we give are usually well above the standard wage. The leading vision of the company is to bring the Western experience to China. Making a piece of Western lifestyle available to the Chinese population. It is more than just selling food. It is exposing something that comes from our own origins to the participants of the foreign society that we are living in and of which we ourselves have become participants. Even though sometimes it is really hard to communicate our vision to the staff, at the end it seems that many of them start to more and more identify themselves with aspects of the Western culture that we are trying to communicate. Some of our employees are clearly proud of working with us. Let’s move on from the past and the general to some more concrete plans for the future. What are your plans with this new platform with the Q group? Last April we decided to separate our ways from Luga’s Beijing that we have built up from a mediocre Mexican and Vietnamese restaurant group to an extremely successful restaurant group with four different country themes; Mexican, Vietnamese, Italian and German. Under our management the Mexican restaurant Luga’s Villa became best Mexican restaurant in The Beijinger Reader Restaurant Awards in 2012, 2013 and 2014. In the year 2013 the readers of City Weekend also decided Luga’s Villa to be the best Mexican Restaurant in Beijing. After our time in Luga’s Beijing we decided to take over the Mexican restaurant Q Mex in April 2014. With Q Mex we went into a very promising partnership with some extremely successful and well connected entrepreneurs from Beijing. After extensively changing the original Q Mex concept and reopening it on the 13th June we were able to increase historical revenues by 200% in only 3 months. This serves us as a very nutritious basis for our future plans to grow Q Mex to a nationwide full service restaurant chain. After gaining so many experiences throughout these years and having talked to so many different people with different backgrounds, what do you think, you as a Karlshochschule alumnus, what competitive advantage does the university have compared to other ones, what makes it non-traditional? The fact that there is a mandatory semester abroad in the curriculum for the study programs International Business and Intercultural Management and Communication already shows that the university really considers its mission to offer the students international experiences in and outside Karlshochschule. My numerous encounters and collaboration with different cultures gave the empathy I needed and still need in order to work successfully in China. Nevertheless, we were always introduced to alternative opinions about every topic we were taught, encouraging us to think for ourselves (out of the box) and have our own opinion after being provided with the necessary factual knowledge, necessary tools. Since entertainment is very important for us, we have already organized stand-up comedy nights, as one of the first ones to host such an event in China. We had guests already from India and New York. Last, but not least: what would be your advice for a fresh graduate of Karlshochschule who wants to start a company in Asia? We are thankful for Deniz for sharing his experience with us and wish him the best of luck in the future. See you soon, but now it is time to get back to work ? So if you would like to get more stories like this, please don’t forget to follow Karlshochschule on Facebook, Twitter or LinkedIn.